Click here to see the mini lesson. To write academically, you need to be able to recognize the way noun phrases fit into sentences. Do this by looking closely at the function of the controlling nouns, (which are the main nouns in a noun phrase. 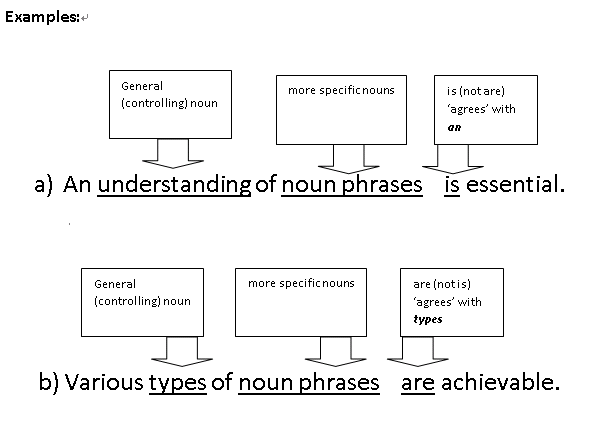 Controlling nouns ‘control’ the verbs which follow them because the verb must ‘agree’ with the noun. You need to recognize the controlling noun first so that you can choose the correct form of the verb that follows it. Be careful of noun phrases that have two nouns connected with the preposition of. Click here to hide the mini lesson. Exercise 1 (Questions 1~10): Make the controlling nouns ‘agree’ by choosing the correct verb to follow the noun phrase. 1. Large amounts of cash ___________ allocated for the new computer centre. 2. A series of fairly easy steps __________ needed to reset an email account password. 3. More people in the classroom __________ to result in more noise. 4. Smaller amounts of sodium in the diet ____________ the heart from disease. 5. A pattern of squares and rectangles _____________ on the building walls each night. 6. Every day a select number of cars ___________ road-tested for safety. 7. A group of students __________ sent to the Provost’s office to discuss the plagiarism in their work. separately and edited together later. 10. Any problems in the online registration system ____________ evident when the vast networks of information _____________ capacity. Exercise 2 (Questions 11~14): Choose the correct form of the verb to agree with the controlling nouns. 1. The improvement in academic writing that use of nouns phrases can deliver _______ it essential to learn how to write them. 2. The importance of using noun phrases in your writing _________ taught in the above exercises. 3. The need to make verbs agree with the controlling nouns that precede them _______also made clear by these exercises. 4. The continued use of well-crafted and grammatically correct noun phrases in English academic writing ___________ university professors.